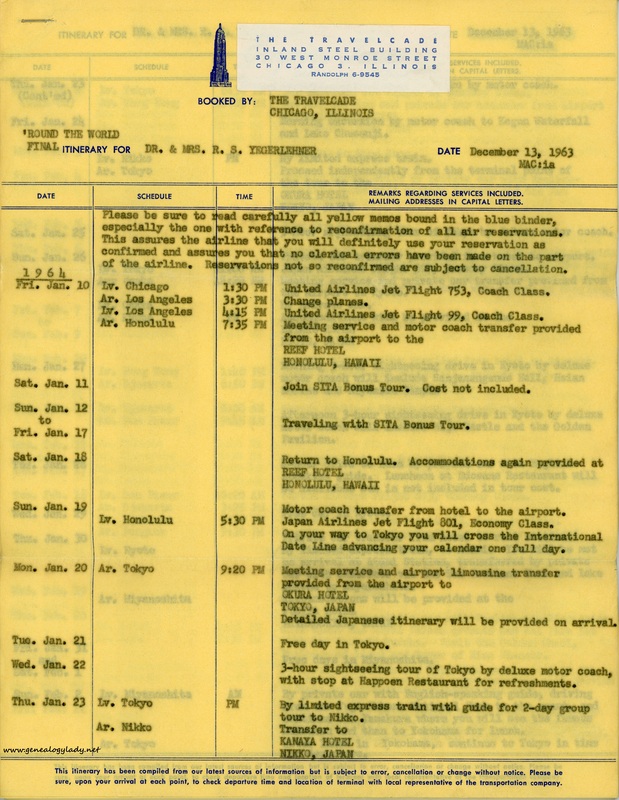 In January 1964, Dr. and Mrs. Yegerlehner left Kentland for a three-month tour of the world. 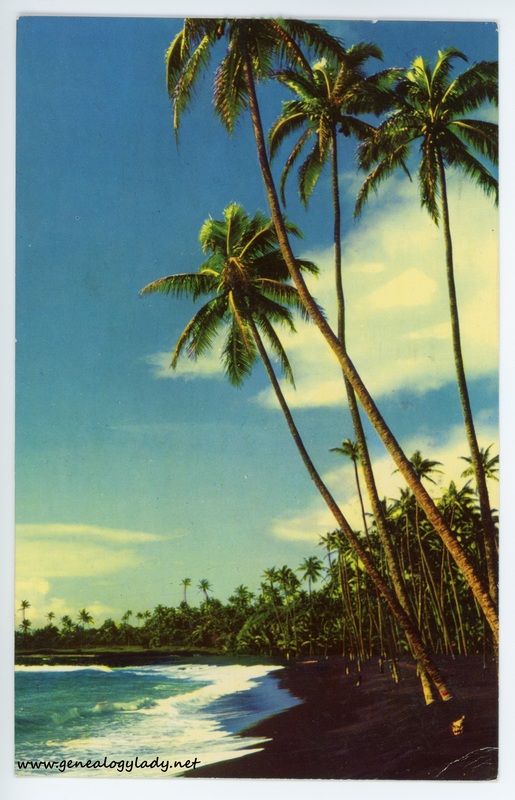 While Roscoe served during WWII, he often wrote of his desire to enjoy the exotic places with Gladys; the beauty surrounding him was wasted on a bunch of stag men. It took a couple of decades, but Roscoe and Gladys did eventually see the world. Avid travelers in their later years, they ventured to every continent, I believe, except Antarctica. A few mementos of their travels still remain in my possession. Roscoe and Gladys took many photographs during their journey. As I continue to scan and organize their collection of slides, look for the occasional photograph to illustrate their letters. According to their itinerary, Roscoe and Gladys began the tour by flying out of Chicago to Los Angeles, then headed first to Hawaii. What a warm treat for the Indiana couple, escaping the throes of winter! As part of the trip, Roscoe and Gladys would travel to Indonesia where they would spend almost two weeks visiting John. The travel agency prepared a list of stops and addresses for Mark and David so they could write letters to their parents. We had a smooth flight. Received traditional welcome of leis and kisses. At hotel a mistake had been made about our room, so manager put us in a Penthouse on top floor with view of Pacific – Diamond Head and about half of Honolulu. Could see a show around swimming pool from our balcony. Had to move to own room this a.m. – nice while it lasted. We are taking tour of Oahu today. Will visit Shirley’s brother & family tomorrow. Nothing planned for Mon. but take outer Island tour. Tues.-Wed.-Thurs.-Fri.-Sat. then start for Tokyo. We are really relaxing and enjoying this 76 temp. 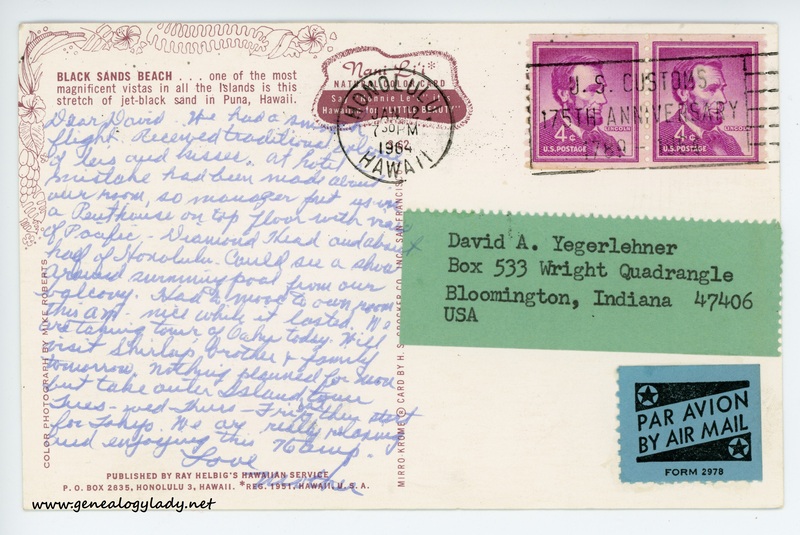 This entry was posted in Genealogy, Yegerlehner and tagged 1960s, David A. Yegerlehner, genealogy, Gladys R. (Foster) Yegerlehner, Hawaii, Indiana, Indiana University at Bloomington, John F. Yegerlehner, Kentland, Mark A. Yegerlehner, Oahu, Roscoe S. Yegerlehner, Shirley (Ward) Yegerlehner, Wright Quadrangle on November 23, 2016 by Deborah Sweeney. This is amazing stuff! I had no idea it survived. Indeed, mother would have been thrilled with the warm weather of Hawaii! We were all so happy for them to be able to get away for such a long time. Yes! And this is why I wish we could find the Hawaii photographs! Now available at Amazon.com! Just click on the book!